Juvederm Ultra is an injectable gel filler that instantly smooths away wrinkles around the mouth and nose, as well as enhances the lips. Used for mild to moderate facial wrinkles. With just one treatment, you will get natural-looking results that last up to a year. Juvederm is a clear gel formulation of hyaluronic acid that is specifically formulated to act like your body’s own hyaluronic acid, adding volume and fullness to the skin. Juvederm Ultra Plus is an injectable gel filler that instantly smooths away deep wrinkles around the mouth and nose.. Used for moderate to severe facial wrinkles. With just one treatment, you will get natural-looking results that last up to a year. Juvederm is a clear gel formulation of hyaluronic acid that is specifically formulated to act like your body’s own hyaluronic acid, adding volume and fullness to the skin. 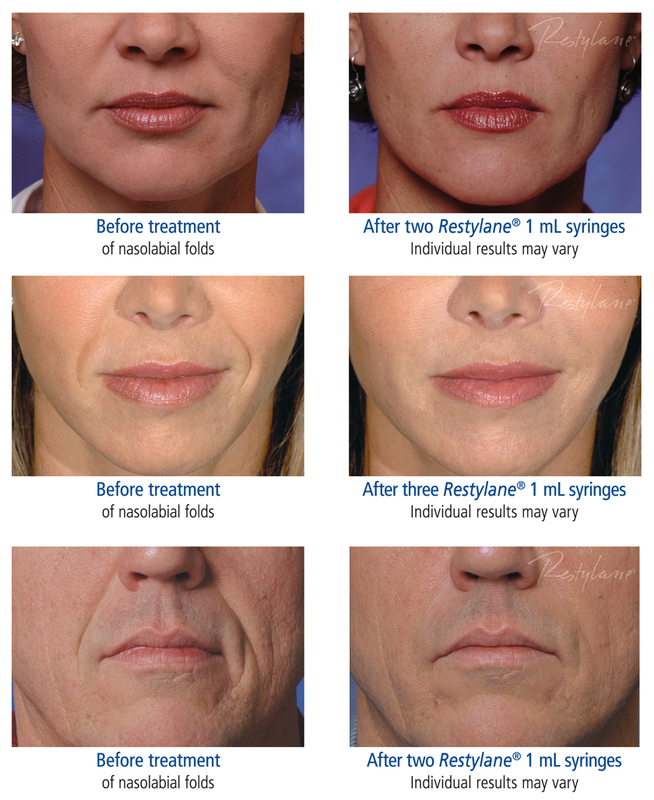 RESTYLANE is a gel that is injected into the skin in order to add volume to lips and lift up wrinkles and folds. Restylane consists of hyaluronic acid, which is a natural substance already present in your body. 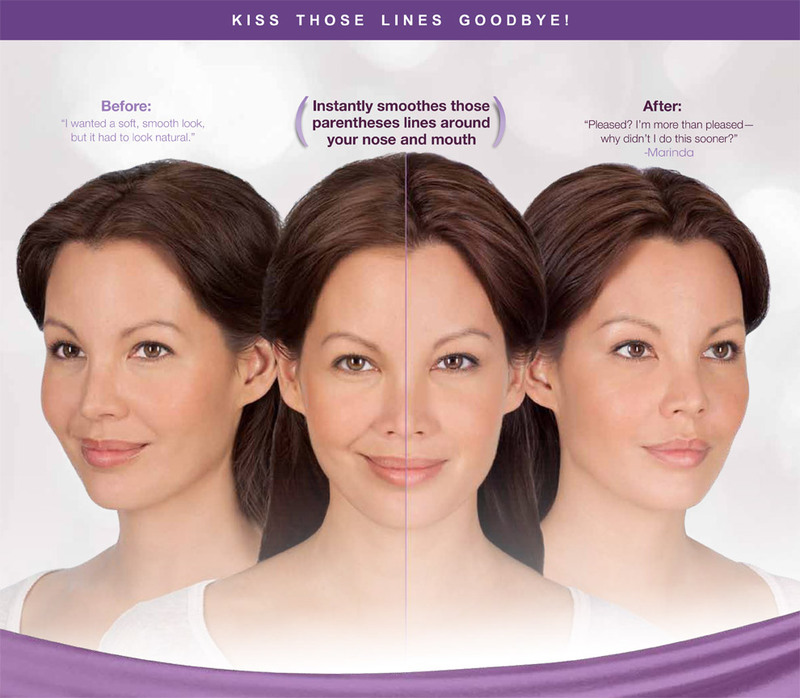 Once in the skin, Restylane works by creating volume and fullness. The hyaluronic acid in Restylane is non-animal, which virtually eliminates any risk of animal based disease or allergic reaction. Restylane can be used to add volume and fullness to the skin to correct mild to moderate facial Lines and wrinkles as well as to enhance the lips. Restylane is a clear gel formulation of hyaluronic acid that is specifically formulated to act like your body’s own hyaluronic acid, adding volume and fullness to the skin. Perlane can be used to add volume and fullness to the skin to correct moderate to severe facial wrinkles and folds, such as the lines from your nose to the corners of your mouth (nasolabial folds). Perlane is a clear gel formulation of hyaluronic acid that is specifically formulated to act like your body’s own hyaluronic acid, adding volume and fullness to the skin. Wrinkle treatments with Radiesse Volumizing Filler are quick and convenient, with immediately visible, long lasting results. Radiesse is the only wrinkle filler that immediately replenishes lost volume and stimulates the production of your own natural collagen for long lasting results.